Added 250 mL acetone to TiO2. Sonicated from 9:18 am to 9:23 am at 20°C to 21°C. Added ABS and sonicated from 9:18 am at 21°C to 5:05 pm at 51°C. Heated the pan at 80°C from 5:05 pm to 6:50 pm. Cut up all the castings from 9/19 and 9/17 into little pieces. Massed total and measured 52.7541 g/ After running though Dr. Fox's extruder just 48.3022 g were measured. Mixed the castings from 9/17 and 9/19 and put them into Dr. Fox's extruder. 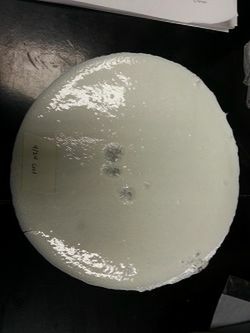 For each run the TiO2 doped ABS was mixed for 2 minutes at 200 rpm and 195°C. 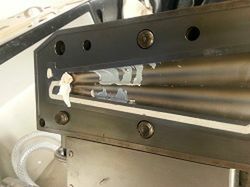 The polymer was then extrudeded and the remains in the machine scraped out between runs. 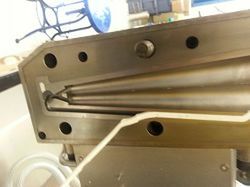 The machine was cleaned with 3 run of 1:2 purge PE at 2 minutes each at 150 rpm and 195°C. The final purge was pure PE mixed for 2 minutes at 150 rpm and 195°C and then cooled to room temperature. When opening the machine it was noticed that the polymer stuck even less to the sides than on 9/17 with the 1%. The cleaning also went relatively fast, only a very little but stuck. The 3rd purge run may have helped with that. The extruded filament seemed to have darkened from a pure white to an off white. All extrusion gave this color so it isn't thought to be a contaminant. The 3-D printer was going to be used for raftless dogbones but it appears that the image of the print is being carved into the bottom. Will wait to consult Megan. The cast made today came out better than the previous 10% cast. No leopard spots were seen like in the 5% but the surface was bumpier. Three large ABS chunks were observed in the center. Figure 1: First scrape of ABS from the machine. Notice how almost no polymer stuck to the sides of the machine. Figure 2: Fifth scrape of ABS from the machine. Even after five runs very little polymer stuck. Figure 3: Casting of the 10%. Notice the three ABS chunks. This page was last edited on 27 September 2017, at 00:23.